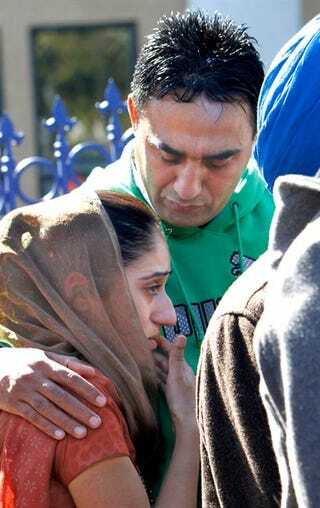 MSNBC is reporting that two elderly Sikh men were gunned down in Sacramento, Calif., while taking a walk. Surinder Singh, 65, died from his wounds, and his friend, 78-year-old Gurmej Atwal, remains in critical condition. Witnesses say that someone in a pickup truck opened fire as they walked through their Elk Grove neighborhood on Friday. The men routinely walk through the neighborhood, and neighbors are accustomed to seeing them. Police said they have no suspects and is there no indication that the shooting was a hate crime, but said the turbans could have made the elderly men a target of extremists. During a news conference Monday at a Sikh temple, a spokesman said the recent violence has scared some temple goers into concealing any indicators of their religion. Sikhs are often mistaken for Muslims and have been the subject of occasional violence across the country since the Sept. 11, 2001, terrorist attacks. Sikhism originated in the 15th-century Punjab region of India. "The enemies of the United States don't wear turbans in the United States," said Amar Shergill, a Sikh leader and attorney. "They don't want to be singled out. The result is that Sikh Americans since 9-11 have borne the brunt of violent hate crimes." If you're going to be a terrorist, you should at least take the time to learn about the people you think you're terrorizing. In addition to what the police are saying, these attacks are as much about the color of the victims' skin as it is about their perceived religion. There is a colossal difference between Islam and Sikhism. Only someone small-minded enough to kill someone for having a different belief system would confuse the two. Killing old men on the streets who were not doing anything to anyone is indeed a crime of hate on multiple levels. In other news: Daily Show's Larry Wilmore to Host Correspondents Dinner.